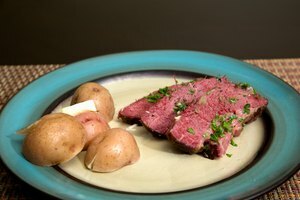 It's easy to be a carnivore if you have the budget to enjoy the best cuts of meat. Premium cuts like strip steaks, lamb rib chops or pork tenderloin are versatile and easy to work with, but they'll also put a big dent in your budget. Cheaper cuts like chuck are easier on your budget, but a whole lot harder to chew. 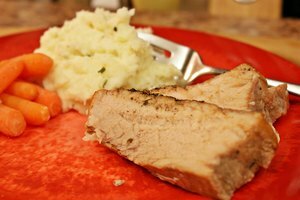 Meat tenderizer powder can help bridge that gap, making your low-cost cuts a lot tenderer and more enjoyable. What Exactly Is Meat Tenderizer? Meat tenderizer powder usually contains a few ingredients such as salt, sugar or cornstarch, but those are only there to provide some bulk. The active ingredient is an enzyme, or protease if you're a food scientist, that weakens the bonds between protein molecules and makes them easier to sever. Several kinds of fruit produce those enzymes naturally, including kiwis and figs, but the two enzymes used most often are derived from papayas and pineapples. The papaya enzyme is called papain, and the pineapple enzyme is bromelain; both are widely used. Adolph's tenderizer and McCormick brand tenderizer both use bromelain, for example. 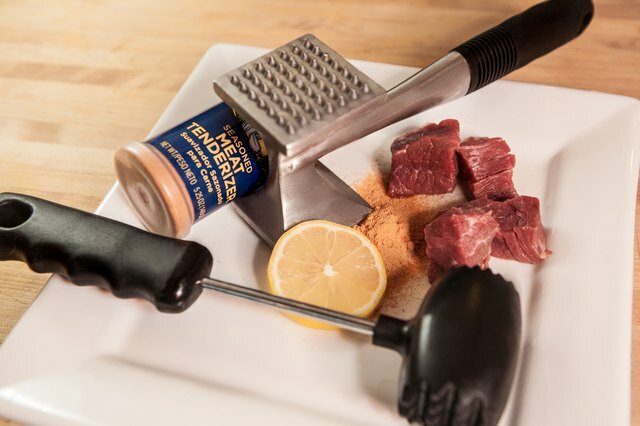 You'll sometimes see recipes calling for "meat tenderizer spice," which is a seasoned version of regular tenderizing powder. The manufacturer adds various spices and flavorings to the mixture, creating a flavor profile that goes well with most meats. The toughness or tenderness of a piece of meat isn't just a question of perception. Scientists actually measure it, in the form of "shear force." Basically, it means how much pressure you have to apply to sever the muscle fibers from one another. A really tender cut, like a filet mignon, chews without a whole lot of shear force. A tough one, like a chuck steak, requires quite a lot of shear force. The enzymes in tenderizing powder denature the proteins in the meat, weakening the bonds that hold the muscle fibers together. That reduces the shear force required to cut or chew the meat, or, to put it another way, it makes the meat tenderer. The effect is limited to about the first quarter-inch of the meat, so it's helpful for steaks and chops but not so much with roasts and other thick cuts. Using your tenderizer powder couldn't be simpler. Sprinkle the powder evenly over your meat, pierce the surface a few times with a fork so the enzyme can penetrate, and then start cooking. Heat activates the enzyme and begins to break down the proteins immediately. If you wish, you can incorporate a bit of tenderizer powder into a dry spice rub or a liquid marinade. 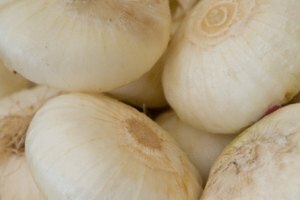 This helps distribute the enzyme evenly, so you don't get random patches of tender and not-tender. 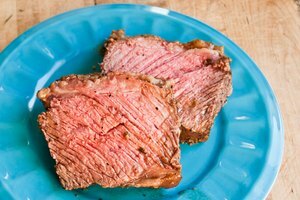 Don't let the enzyme sit on the meat for more than a few minutes, or up to 30 minutes for a really thick steak. If the enzyme stays on your meat for too long before it's cooked, you can end up with too much tenderization. If that happens, your meat will develop a weird and rather unpleasant mushiness. Tenderizing powders aren't the only way to make a tough cut tender. Pounding your piece of meat with a meat mallet tenderizes it by tearing the muscle fibers apart with blunt force. The needle-type or "Jaccard" tenderizer device cuts the muscle fibers, shortening them and making them easier to bite through. For the biggest impact, your best bet is to use a mallet, Jaccard tenderizer or other meat tenderizer tool on the steak first. Then, when you apply the tenderizer powder, the surface of the meat will be filled with punctures or tears where the enzyme can penetrate and do its work. Comprehensive Reviews in Food Science and Food Safety: Applied and Emerging Methods for Meat Tenderization - A Comparative Perspective; Zuhaib F. Bhat, et al.